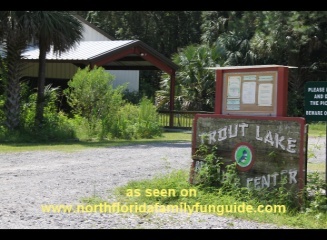 Trout Lake Nature Center is an interesting wildlife preserve located on 230 acres bordering Trout Lake, in Eustis, Florida. This Nature Center has a Museum/Classroom (Charles Newell Hall), and also an Environmental Education Center on site. They also have a covered outdoor gathering place for special educational instruction. There are interpretive trails throughout the property, and a 1000 ft boardwalk leading out to Trout Lake. In the Museum, and the Education Center, there are hundreds of preserved Florida Wildlife specimens to look at, and learn about, including a Florida Panther, Black Bear, Bobcat, many species of birds, insects, amphibians, and fish,too. There is a Florida butterfly specimen exhibit, including a large collection of moths. In the Environmental Education Center, there are live turtles and a real corn snake that we had the chance to meet up close and personal. We loved the Touch Tables, which had lots of interesting artifacts, bones, snake skins, feathers, wild animal footprint castings, alligator hide, shark jaws, fur, antlers, etc. This was a really good learning experience for Bryan and he spent a great deal of time going over everything that interested him on those tables! Outside in the courtyard there is a butterfly habitat which was in full bloom, attracting many different kinds of butterflies, and some large grasshoppers and dragonflies too! This is a great place to come and take a leisurely walk on the trails, and boardwalk, and come learn some interesting things about Florida's wildlife! Bring a group and sign up for one of their interesting interpretive programs. Trout Lake Nature Center has put together many fun and interesting programs geared towards children. These programs are very popular with the public and private school systems, homeschool groups, 4-h clubs, Girl Scouts and Boy Scouts, and more! Activity 1 – Spider Sensations – Volunteer docents share fun bio-facts about spiders and then students play the game Spider Sensations, pretending they are spiders. Activity 2 – Spider and Insect Hunt – Students explore the Trout Lake Ecosystem and hunt for spiders, spider webs, and the insects they might eat. This includes dipping at the lake to look for fishing spiders. Activity 3 - Spider Walk Relay Game – This fun active game increases the student’s awareness of animal (particularly spider) adaptations which help them capture their food. Activity 1 - How many bears can live in this forest? Students role play the lives of bears, to learn how bears find their food, the types of food they eat, and important lessons about competition for resources. Activity 2 - Walk like a bear – During a walk down the trail to the lake children pretend they are Florida Black Bears and look for the things they need for food and shelter. Activity 3 – Illustrated bears – Students are given “draw a bear” instructions and then asked to draw a Florida Black bear in its ecosystem with the things it needs to survive. Activity 4 – What makes a bear a bear? Students explore the museum and then participate in a guided discovery activity looking at bear and other animal skulls, a bear skin, and a poster skeleton bear to understand how the bear is designed to survive. Activity 1 – Exploring Trout Lake – Students walk the boardwalk over the marsh to the lake. At the lake they use the dip nets to observe aquatic animals close up. Activity 2 – The Long Haul – Students participate in a water relay to help them understand some of the reasons modern people use much more water in their daily lives than people used in the past. Activity 3 – Aqua Bodies – Students explore some familiar objects (grapes/raisins, live frog/dehydrated frog) to increase their awareness of the role of water in life. Students participate in activities which illustrate how much water is in their own bodies. If your group would like to participate in any of these special activities, call Trout Lake Nature Center at 352-357-7536 to reserve a date and time. We loved this place and hope to come back soon!